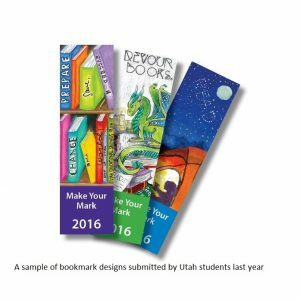 (Salt Lake City) The Utah Educational Savings Plan (UESP) and StepUp to Higher Education will celebrate National College Savings Month in September by sponsoring the annual UESP Make Your Mark bookmark design contest. Eight Utah students in kindergarten through grade 12 each will receive a $1,000 college savings scholarship for their winning bookmark designs. The goal of College Savings Month is to encourage Utah families to save for future college or vocational school expenses. A five-judge panel that includes Utah Gov. Gary Herbert; First Lady Jeanette Herbert; Lynne Goodwin, executive director of the Treehouse Museum in Ogden; Noelle Cockett, president of Utah State University; and Pat Bagley, editorial cartoonist for The Salt Lake Tribune, will select two winning bookmark design entries from each of four grade categories. Scholarship recipients will be notified in mid-October. All decisions by the judges and UESP are final. In addition to receiving $1,000 UESP college scholarship accounts, each winner’s artwork may be professionally reproduced and distributed at UESP events throughout Utah. The Make Your Mark design competition is in its eighth year. “The Make Your Mark competition is an effective motivator for families to start or increase savings for the future college costs of their children,” said Lynne Ward, UESP executive director. “Here at UESP, we like to point out that saving early in a tax-advantaged account makes higher education more attainable. The sooner a family starts, the more time your money has to add up and potentially grow,” Ward said. The contest runs September 1 through September 29, 2017. Utah students are eligible to enter if they are enrolled in a Utah school or are home-schooled. Parents are not required to own a UESP account. Entrants must submit an original bookmark design on the official entry form. Visit my529.org/make-your-mark-2017 to find an entry form and see official Make Your Mark contest rules. Only one entry per student is allowed. UESP must receive all entries no later than September 29, 2017, at 5 p.m. MT. Submit entries by mail, courier, or hand delivery. Address information and contest rules and restrictions are detailed on the back of the official entry form. The contest is not open to past Make Your Mark winners or children of an adult employed or affiliated with the Utah State Board of Regents, Utah Higher Education Assistance Authority, UESP, StepUp to Higher Education, or their advertising agencies. Earnings in UESP college savings accounts grow tax-deferred, and withdrawals are exempt from federal and Utah state income tax if used for eligible educational expenses such as tuition, mandatory fees, books, computers, internet access, and certain room and board costs. Utah tax credits are also available to Utah account owners for contributions made to their UESP accounts. StepUp to Higher Education is an outreach initiative through the Utah System of Higher Education that aims to increase the college participation of Utah students, especially those who may have never considered higher education as a practical option after high school. The StepUp to Higher Education initiative is made possible by a College Access Challenge Grant from the U.S. Department of Education.